It's always fascinating, as a video game fan in 2013, to pick up old games and see how well they've aged. Sometimes you're disappointed. You discover all the warts and blemishes that somehow looked oh-so-lovely a decade ago. You find that Xenogears, which you consider a masterpiece, has text so slow you'll start thinking about how short life really is. You realize that buying one item at a time in the original Final Fantasy is just as tedious as it sounds. You start to really appreciate just how much user interfaces have improved over the past few years. But sometimes, as I discovered last night while revisiting Zelda: Oracle of Seasons, you'll go back to a game and find it's just as stellar as your memory says it is. Some background. 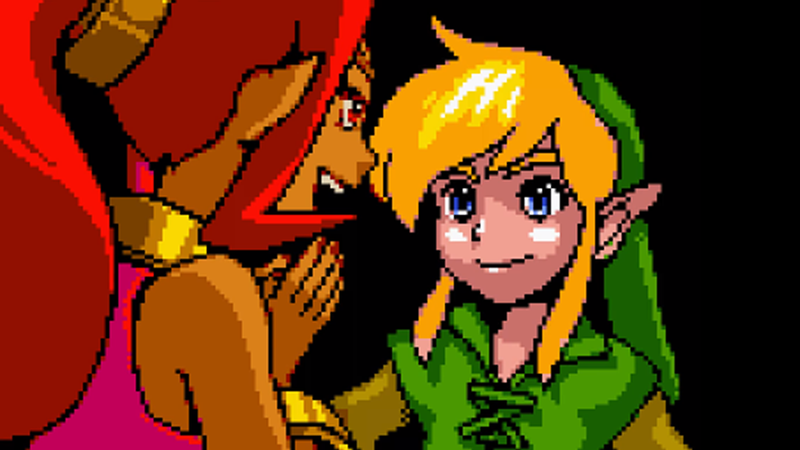 Zelda: Oracle of Seasons is one of two Zelda games designed for the Game Boy Color. The second is Zelda: Oracle of Ages, and although their names share a bunch of words they're actually totally different games. Both are top-down 2D Zeldas in which you get a sword and a shield and bombs and a boomerang and you do all of the things you'd do in any Zelda: explore, slash, solve puzzles, rinse, and repeat. Each game has its own set of unique items, too, and its own gimmick: in Seasons you are given a rod that controls the seasons; in Ages you wield a harp that lets you travel through time. Both Oracle games were released for the Game Boy Color in 2001, and again on the 3DS eShop yesterday. (For the special discounted price of $4.99 each, on sale until June 20 when they revert back to... $5.99 each. Thanks a lot, Nintendo.) I played them both for the first time when they came out back then, and then again yesterday. You can play the two games in any order. When you beat one, you get a password that you can use to switch things up a bit in the second. When you finish both, you get to fight the real final boss. This time I went with Seasons first, because in 2001 I started with Ages, and I thought I'd switch it up a bit. Three dungeons in, I'm sold. The top-down world feels vaguely familiar yet constantly surprising. It's fun to hack away at tiny, washed-out versions of classic Zelda enemies like moblins and Like-Likes. It's even more fun to enter a brand new dungeon and slowly piece together its secrets, letting everything click together one puzzle at a time. But the best thing about both Oracle games, which were developed by Flagship, a former Capcom subsidiary that also made the excellent Zelda: Minish Cap for Game Boy Advance, is that they're just straight-up full of stuff. Walking around the world map for even thirty seconds will inevitably lead you to a kangaroo who lost his boxing gloves, or a palace full of nasty Moblins, or a random encounter with a ditzy witch. Everything is very dense. Compare this to, say, the seemingly-endless oceans of Zelda: Wind Waker, or the vast skies of Skyward Sword, in which navigation feels like an uphill battle and sidequests often make you wonder whether they're worth the time you'll have to spend traveling. In the Oracle games, traveling is a pleasure on its own. Not to say that either Wind Waker or Skyward Sword are bad games: each is excellent for different reasons. But the Oracle games deserve just as much praise. I'll have more to say about both games—which most definitely count as Japanese role-playing games, since they are action-RPGs made in Japan—as I spend more time with them. But for today, if you are wondering whether you should get them on your 3DS, I am pleased to announce that yes, Zelda: Oracle of Seasons and Zelda: Oracle of Ages get the official Random Encounters Recommendation. They've aged quite well. Go check them out. Random Encounters is a weekly column dedicated to all things JRPG. It runs every Friday at 3pm ET. You can reach the author at jason@kotaku.com or follow him on Twitter at @jasonschreier.